Seafront Diary: Finding the bottle..........explorations continue. A while ago a distant uncle, whom I can only ever recall meeting once, passed away and bequeathed his little seaside summer house to me in his will. Having no knowledge of this uncle or his life, I had little idea of what to expect as I travelled from my little rented studio flat above the book shop where I worked in Exeter to the Sussex coast. However never in a million years could I have expected that a 'little summer house' would actually turn out to be a five floor seafront mansion built in the 1880's. 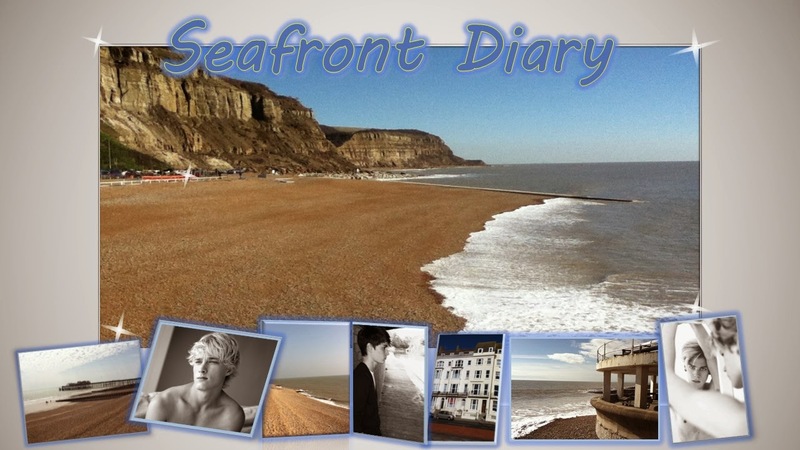 - Here I chronicle my life and experiences from the house on the seafront and following my last post, I continue recounting my explorations from the very first day I arrived here. A strange almost voyeuristic sensation swept rapidly through my mind as I further explored this seafront house that was now, at least in name, mine, although I wondered as I took the back stairs down to the lower ground floor if it ever would feel like home. There was a half glazed door to what appeared to be a small rear courtyard, I tried the large old fashion key protruding from an equally old fashioned lock, but turn it would not and thus the courtyard would remain unexplored, for the present time at any rate. Immediately to the left of the bottom of the stairs was another door, all natural wood as those on the upper floor, pushing it open it revealed a small cloakroom. The toilet had an old wooden seat and the cistern upon the wall seemed so old that I’m fairly sure it could have been an original feature from the 1870’s or 80’s, which made me smile for some reason. I passed a leaded light window on the rear wall overlooking the rear courtyard and found that the room opened up passed a white painted wood panelled pillar. I gasped audibly as I found myself in a large cavernous kitchen that occupied almost all of the lower ground floor stretching all the way to the front of the building. There was an incredibly large wooden table positioned in centre, its surface faded and covered in a later of dust, yet still its beauty was evident. On the left hand side of the room was two large butler style sinks, beside which appeared to be an old butchers table upon which stood old boxes and bottles of various detergents and cleaning supplies. Further along was a large free standing cupboard with frosted glass doors, through which some tins and cartons could just be made out. A range cooker the like of which I’d never seen before, at least not in real life, seemed to dominate the centre part of that long side wall. It was vast and I wondered how on earth I was ever going to be in a position to use it all, assuming of course I could learn how the blooming thing worked. A further wooden work surface and open shelving storage beside that conveyed a myriad of pots and pans of various styles shapes and sizes that indicated Uncle John must have been a jolly keen cook. Another freestanding cupboard with matching frosted glass doors seemed to mark the end of the kitchen area of this lower ground floor of surprises. Further exploring I found that on the opposite wall was a large upright refrigerator and next to which, of equal stature was a freezer, thankfully or not, both were empty and either switched off or unplugged. Beyond the freezer against the wall was a long dark desk, piled high with papers, books, magazines and the odd newspaper. The latest offering I surveyed was a March 2012 edition of Private Eye with a photo of Barack Obama and David Cameron on the cover and I somewhat assumed that must have been the last day this slightly ramshackle building had had any human occupiers. At the front end of this impressive room of mammoth proportions was a large open fireplace, piled with logs and beside an empty but definitely used coal scuttle and for a fleeting moment my mind fast forwarded to many month from now on a cold winters morning where I’d build up a big log fire and banish those winter chills. The though dissipated away as I sat on the arm of a rather shabby sofa that had been pushed up against the far wall in the kitchen, what was indeed the front of the building, under a rather high window. It was only for this position that I noticed firstly that the floor was all flagstone, except around the range cooker where it was red brick and secondly there was another door, this time to the front of the building, which I hadn’t noticed at first. I tried the key that protruded from an ornate and old fashioned lock in an almost obscene fashion. A little resistance from a mechanism stiff with inactivity and the salty sea air eventually gave way with a resounded and reassuring thud. The handle turned freely and with a firm pull the door opened inward and the sea air once again breezed into the vast kitchen, for the first in goodness knows how long. I stepped out and looked around, it was a small courtyard, an alcove with two dark green wheelie bins, a few old empty plant pots, a rusty tin of exterior emulsion paint and an equally rusty bicycle frame, minus both wheels and saddle. Other than an addition of what appeared to be an electricity of gas meter cupboard, there was just stone steps back up to street level, which I’d somehow missed on the way in. I re-entered the house, closing and locking the door behind me and walked back through the kitchen and up the stairs. For some reason the hairs on the back of my neck stood to attention as I climbed the stairs, first to the ground floor and then those of the more grandiose staircase at the front of the building. Perhaps a sensation of mild trepidation seeped into my consciousness as I took the beautifully traditional stairs deliberately, as I rounded the top stair into another foyer or landing I wondered if I’d ever feel at home here. There were a number of doors, just like the ground floor, all natural unpainted wood, although in truth I would imagine there had been stripped back to their natural state many moons ago, I inwardly conjectured how many layers of paint would have been removed before the natural wood appeared. The first door was an anti-climax as it transpired to be nothing more than a cupboard of shelves devoid of everything except dust. The second door opened to a large room overlooking the rear courtyard which had evidently been Uncle John’s study for it was occupied by a massive, almost stately writing desk positioned right in the middle of the room, facing the window. The surface of the desk was obscured by papers, documents, old newspapers, magazines and a pile of dog-eared books. Also on the desk was an old lamp with a green glass shade, much like those seen in the banks of old movies and a ceramic pot with a single pen poking lonely out of the top. Against the side wall were a number of old roughhewn packing cases, which, after a casual glance seemed to be full of old books, papers and other such items of a similar nature. The only other furniture in the room other than a small chair sat behind the desk was a shelf to the right of the rear window upon which sat a half-finished bottle of jack Daniel’s and two upturned glasses. I must admit, despite disliking the taste of the rusty orange coloured American sour mash liquor, I was tempted to reach for the bottle and take a swig. Temptation resisted I continued my exploration of the house on the seafront. The door to the next room opened freely and only with the merest hint of a creek and once open revealed the contents of the room which in turned cased a sudden gasped influx of breath, I’d found Uncle John’s odd special bottle collection. 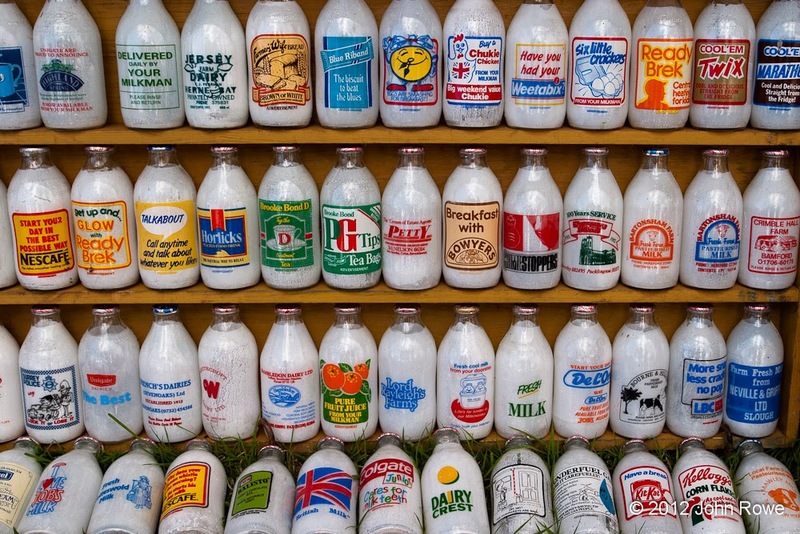 Before me, on wooden bookshelf’s against all the walls of this room was an amazing collection of milk bottles either decorated with painted pictures, funky designs or sporting a remarkable variety of advertisements for an equally diverse number of products and manufacturers. The sight completely took my breath away, for I had never seen such a collection before, it was most remarkable and must have been the results of many years’ worth of collecting. 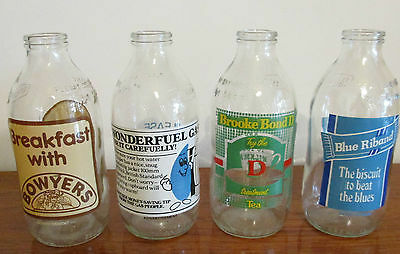 At first some of the bottles appeared to be still full of milk, however upon closer inspection I found plain white paper had been carefully inserted to resemble their former liquid content. It made me chuckle to myself, Uncle John must have had plenty of time on his hands, although thinking about it, if he could afford to have a house this size as just his summer or occasional residence, he quite probably didn’t need to toil away like the rest of us. There were a couple of cardboard boxes, the size of which must have been similar to the wooden ‘tea’ chests of old and a careful manipulation of the flaps upon the top revealed dozens and dozens of bottles sans the white paper. I was both fascinated and alarmed by the discoveries of this room, fascinated by all the various designs and adverts, yet alarmed by the notion that these were now ‘my’ processions and therefore it was my responsibility to do something or nothing with them. I could have spent hours hour’s pondering that very question and examining each of the milk decanters, however I decided that would be a job and a question for another day, as further exploration today as necessary. Back in the hallway I opened the door to what I thought would be another room, only to find it was little more than a small store cupboard, with empty shelves and a broom minus its handle its only contents. The next final door on this hallway gave a little resistance when I turned the handle and creaked loudly as it began to open. I found myself in a grand sitting room with a high and ornate ceiling complete with fancy coving, cornicing and a central rose from which upon a big looped chain hung a chandelier. Even in its dusty and unloved state the sight was impressive, dozens of dangling glass or crystal droplets or pendalogues still managed to shine and reflect light from the huge floor to ceiling windows on the front wall overlooking the narrow balcony. Despite it being day time and the room being filled with bright natural sunlight, I couldn’t resist flicking the light switch beside the door. After a brief flicker, a dozen little bulbs upon simulated candle sticks upon ornate crystal or glass bobeche danced into life and shafts of light from the myriad of prisms shimmered evocatively over the room. I have resented the fact that I hadn’t waiting till dusk or evening to flick the switch, for in darkness the beauty of this chandelier must be tenfold. Then just as a small child might, I filled my lungs with a giant gulp of air and blew out with force and despite its relative height, the lower levels moved and danced in the manmade breeze. However the large gust of wind from my lungs also dislodged a fair portion of dust that seemed to cloud the view somewhat. It was clear the extravagant illumination hadn’t been cleaned or dusted in a vast number of years and immediately I flicked off the switch and added its cleaning to my mental list things ‘to be done’. Occupying the central position on the right side of the room was an impressively large ornately carved fireplace. I knew little of such things, so I couldn’t even begin to guess as to its age or origination or relevance to this room, it was just an impressive sight for the eyes to behold. The relatively any coal, wood or kindling, so I knew not if it was a working fireplace, so to find out was yet another thing added to the ‘to be done’ list. The front and two side walls were painted a rather unimaginative and disappointing magnolia, while the rear had been covered in a contrasting dark almost burgundy coloured wallpaper that seemed perfectly suited to the room and I almost wished it had been used on the remaining walls as well. The floor was laid to bare floorboards, all dark stained with age and decades of wax, polish or stain and seemed to be in apparently good order and worn much less than the floors in other areas of the house. I gazed around this rather impressively sized room, no paintings or pictures hung upon the walls and only two items of furniture occupied this cavernous chamber. For there, in the centre of the room, standing stoutly under the chandelier facing the vast windows was a single dark green traditional three seat Chesterfield sofa which seemed to evoke images of times gone by, or perhaps that was my mind working overtime, yet it seemed perfect for this room, perfect for this house and even indeed this very town. The other item of furniture was a matching and apparently well used Chesterfield footstall immediately in front of the sofa, beside which was stacked a pile of old books. My assumption on their age came from that fact that there all appeared to hard cover volumes, sans dust jackets and you don’t seem many of those for sales in book shops these days. I walked to the windows and gazed out at the rippling sea beyond, it truly was a remarkably lovely view and I could quite easily understand why there was no other furniture in this room, it seemed perfect for sitting and reading in solitude or gazing out at the never still sea. For the briefest of moments I envied my uncle for being able to enjoy this tranquil sanctuary at will, then I remembered it was no longer his, he was no longer here and it was mine, mine to enjoy. I had to keep mentally and physically pinching myself, this wasn’t a dream, this wasn’t a fantasy, no this was a reality. :) what a lovely short story!